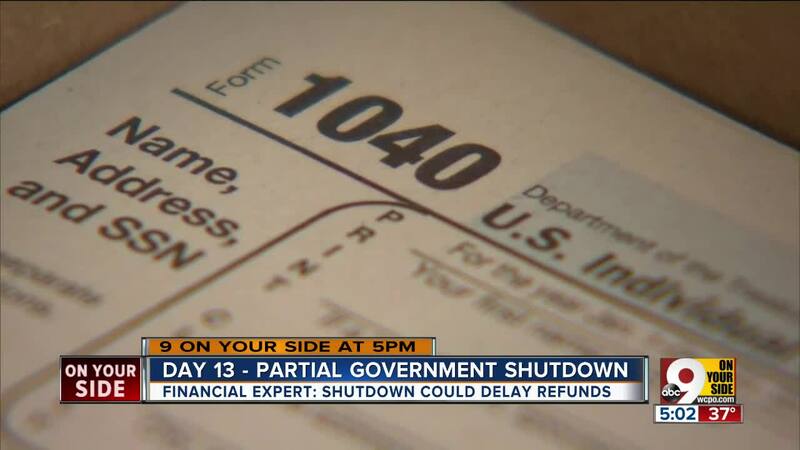 The government shutdown could delay your tax refund if it continues much longer, a local expert says. With staffing down 88 percent, the IRS facility in Covington is not set up to process refunds, says Scott Moffit, president of Summit Financial Group. That's raising worries among area taxpayers. ”Some people depend on those tax refunds for a living and expenses,” said Sarah Giese. COVINGTON, Ky. — The government shutdown could delay your tax refund if it continues much longer, a local expert says. With staffing down 88 percent, the IRS facility in Covington is not set up to process refunds, says Scott Moffit, president of Summit Financial Group. That's raising worries among area taxpayers. ”Some people depend on those tax refunds for a living and expenses,” said Sarah Giese. With the shutdown in its 13th day, some 800,000 federal employees have been furloughed without pay. That includes tens of thousands of IRS workers. The shutdown has stopped most of the IRS operations in Covington, said Moffit. “Probably no surprise, they are still capable of taking your money, and they are still capable of processing returns that are being submitted," Moffit said. The IRS generally will not respond to taxpayer questions during a shutdown, Moffit said. That could lead to more confusion than usual because this is the first year the new 2017 tax codes will be used. “With the personal tax exemption going away, with standard deductions increasing and a lot of other changes in terms of your tax bracket and things of that nature, I think there’s going to be just a lot of general questions about whether people are going to owe more, whether they're going to get more money back, and it really is a case-by-case basis,” Moffit said. If you have questions or concerns that you may be filing incorrectly, Moffit suggests you consul a tax professional or delay filing your return. You can always file for an extension, but if you owe the IRS, you must pay on time or pay a penalty. Of course, having the government shutdown last into tax season is a worst-case scenario. Mike Schmerge, who lives in Loveland, says he doesn’t think the shutdown will go that far. Or will it? “I am optimistic it will get resolved,” Schmerge said. “We’ve been in this position so many times and I think everybody’s just expecting it to get resolved.